Strictly a cold-weather disease, typhula blight appears where snow cover has melted, especially in areas where snow has drifted or been piled. 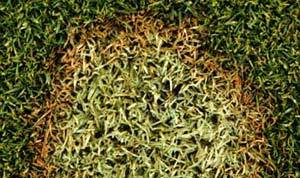 Look for: Irregular 2 to 24 inch patches of bleached-out, matted turf covered with moldy, grayish white mycelium. Embedded in the leaves and crowns of infected plants you will see tiny black or orange-brown spherical sclerotia (hard fungus bodies). Management: Avoid heavy nitrogen fertilization in late fall to allow new growth time to harden off before winter. Keep thatch to a minimum and grass height lower as winter begins. Avoid piling snow and limit activity to prevent compaction on important snow-covered turf areas. Rake in early spring to promote drying and reduce matting. Provide a light spring fertilization if damage is present. This disease develops between late fall and early spring during cool, moist, cloudy weather, with or without snow cover. Look for: Small, light tan to rusty brown circular patches that may grow up to 2 feet and become ring-like as interior grass re-grows. 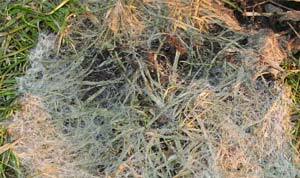 When the grass is moist, the salmon-colored mycelium becomes visible in sunlight. Management: Fertilize in late fall, once grass growth ceases, with a slow-release nitrogen fertilizer. Mow the lawn, keep thatch low, and do not allow leaves or debris to remain on the lawn over winter. Rake the lawn well in early spring, and follow with a light fertilization if damage is present. As with any older, disease-prone lawn, consider upgrading to one of today’s high-tech cultivars. You may be able to make a gradual transition by overseeding in successive years, or you may need to remove the existing turf for replanting.